Gluten free eating and living can be overwhelming. There is so much to learn and navigate and we often feel alone in our food challenges. Because I know how challenging gluten free can be I decided to start a new series interviewing gluten free bloggers. My goal with this is to introduce you to some great gluten free sites that are full of information and to also help share some basic information from those that are living the gluten free life. I hope you find this series helpful and informative. Today we are starting with Linda The Gluten Free Homemaker. I met Linda right around the time I went gluten free and she helped me so much those first few months of navigating the gluten free world. I have been able to meet Linda in real life several times now and have really enjoyed getting to know her. Thanks Linda for taking the time to share your thoughts. Linda Etherton never apologizes for serving gluten-free food because she believes gluten-free can and should be delicious. She enjoys sharing her gluten-free knowledge and helping others at her blog GlutenFreeHomemaker.com. Who in your family is gluten free? My 21 year-old son and I are gluten free. How long have you or your family member been gluten free? I have been gluten free since 2000 when I was diagnosed with celiac disease. My oldest son went gluten-free in 2010 when he developed symptoms of gluten sensitivity. He did not test positive for celiac disease. What changes have you seen in gluten free over the last few years? Do you think those changes are for the better? Gluten-free has certainly become more main stream. That’s good and bad. Doctors, restaurant staff, retailers, friends, and family are all more aware of the gluten-free diet. There are many more products available, and they’re getting better all the time. The problem is when people do not understand that the gluten-free diet is a medical necessity for most of us. They think of it as a fad diet and don’t realize that people like me and my son have to avoid even tiny amounts of gluten that can come from cross contamination. I think that overall the increase in awareness is a good thing, but we need to stay on top of educating people about celiac disease and gluten sensitivity. Do you deal with any other food allergies or intolerances besides gluten? I have minor reactions to milk products and therefore avoid dairy. This is common among people who cannot tolerate gluten. At first, eliminating dairy seemed overwhelming, but I quickly learned that it was not that hard. There are many great substitutes, and I found that most of my favorite cheese and milk filled recipes tasted great without those things. Even my family is happy with most of the ingredient substitutions or omissions. What advice would you give someone new to gluten free eating? Try to keep a positive attitude. There is a lot to learn at first, and such a drastic diet change seems overwhelming. There are many people who have already done this and are living happy healthy gluten-free lives and enjoying the food they eat. You will too! Gluten free eating can be expensive. What tips do you have for dealing with gluten free eating and the grocery budget? Stick with healthy whole foods that you can find at any grocery store. Decide what extras are most important to you and either make them from scratch or compare prices in stores and online to find the best deals. Even baking from scratch can be more expensive because gluten-free flours cost more. Search for the best deals. Many gluten-free flours can be ground at home using a grain mill, but that requires an initial investment. I found that it paid off in the long run. Do you attend, or have you ever attended a gluten free support group? If so did you find them helpful and why? I have always attended a support group and found them very helpful. Support groups bring in guest speakers and vendors, and they are a source of information, help, and of course, support. They are particularly helpful for directing you to local stores and restaurants that are gluten-free friendly. Gluten free eating can be challenging and time consuming. I would love to know a few of your favorite gluten free foods that you make and serve your family on a regular basis. 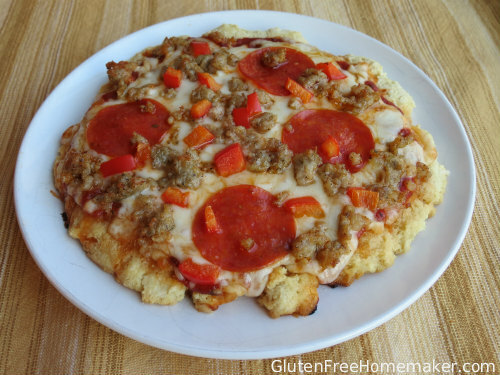 Pizza was one of the first foods that I learned how to make gluten free. If I could have pizza, I knew I could survive the diet. I make a number of crust versions, but biscuit crust pizza is a family favorite, and it is much faster than making a yeast crust. I love muffins as a breakfast food because they can be made ahead of time and they’re great for grabbing on the go. They are also versatile, and you can put so many different ingredients in them. Almond cranberry muffins are one of my favorites. My angel food cake is very popular. No one can tell it is gluten free, and even gluten eaters think it’s amazing. Even though my kids are not very fond of spinach, they do love spinach dip. This dairy-free spinach dip is just as good as the dairy-filled version. Do you have a favorite gluten free cookbook? It’s impossible for me to choose one. I’m particularly fond of Carol Fenster’s books. Do you have a favorite gluten free restaurant or place you like to eat? Outback Steakhouse is definitely my favorite. There is one close by, and when traveling, it’s usually easy to find an Outback. I’ve never had a reaction after eating at an Outback, though I always explain my needs to the waitress or waiter. When my family goes there, everyone can find something they like. Thank you so much Linda. If you have not visited The Gluten Free Homemade I encourage you to. Linda is a wealth of information when it comes to gluten free eating and living. Wonderful interview! I love her blog, too. Thanks, Flora. You’re right, who knew? ?